What I like most about these "cheat days" is how predictably they remind me that I like eating healthy. Because of my perceptions before beginning to eat healthy, I imagine that most people would find this hard to believe. I remember exactly what I thought when I realized that certain foods, sugar and flour, needed to be eliminated from my diet: "I have to do this, but it's going to be a big sacrifice." I was willing to make that sacrifice, but the reality of the situation turned out to be quite different than expected. So for people interested in understanding what it's objectively like to eat healthy, or for those trudging through the acclimatization process, I figured I'd offer a few paragraphs describing what it's actually like. There are sacrifices, to be sure, although they aren't what I initially expected. The biggest downside is convenience: your restaurant options go from roughly every restaurant in the city to less than five. You usually can't just get a meal on the go; you have to go out of your way. For example, when going skiing, there's no food on the mountain that I can eat. So I have to make sure that I eat before skiing, and then drive ten minutes away from the mountain afterwards to the one healthy restaurant in Tahoe. This isn't normally a big deal, but I'll admit that when pressed for time, I think back to how convenient it was to just grab a burger and keep moving. The other notable downside is that you become an inconvenience to your friends. If they want to eat with you, they have to go out of their way to one of your restaurants. Luckily these healthy restaurants tend to be good enough that even unhealthy eaters will enjoy them, but you still extend the inconvenience of limited selection to your friends. Enjoyment of food isn't the liability I thought it would be. After my five days of eating garbage in Oslo (with the greatly-appreciated exception of delicious Arabic food prepared by our friend Noor), we took the train to Stockholm, where Todd found a vegetarian buffet. The best analog for the feeling of eating healthy food after a period of eating dirty is to say that it's like getting into bed after a long day of running around. Just as you don't realize how tired you are until you hit the pillow, you don't realize how much you love healthy food until you take that first bite of spinach-lentil soup. Our whole meal of beans, vegetables, and little else, was punctuated with us vocalizing how good the food was, almost involuntarily. The first bite of junk food tastes good, even to someone accustomed to healthy food. The second is okay. By the end of the meal it's a little bit gross and my stomach feels full in a way that feels natural only if you've never eaten healthily for a significant period of time. Half an hour after the meal I'm craving more junk food, even though my stomach feels a bit sloshy. I feel tired and usually think to myself, "That meal was so dumb." Eating healthy food is different. The first bite is good. So is the second. As the meal progresses, the food continues to taste as good as it did initially. After eating, I'm full but can still jog without feeling gross. Transforming into a healthy eater isn't a process of self-deprivation or sacrifice (at least in the long term), but rather an acclimatization to a better perspective on food. You can still stomach normal food if you have to, but it no longer takes will power to stay away from it. All it takes is eating it occasionally. 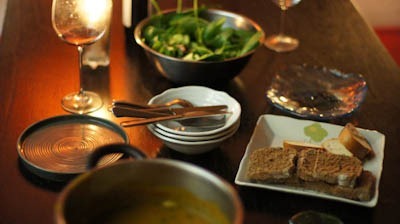 Photo is some clean and delicious food prepared by my friend Toby in Tokyo earlier this year. There's an interesting NLP technique I learned during a practitioner course that re-encodes the way you perceive and experience food by changing the mental placement of where the food is visualized. I've tried it with fried ice cream (which I used to love) and I haven't craved it (or had it) since. It took all of 60 seconds to reprogram that. It can be a LOT easier than people imagine. Karol's Luxury of Less book and his attitude towards healthy food has influenced me and my girlfriend to start eating a 95% veg diet so I can relate to the "feel great all the way" experience. About the salt, I have noticed this too. Some food is so packed with sodium it's inedible. Thank you! I have been looking for some motivation to restart my healthy eating lifestyle and this was just what I needed! I feel you on this one on so many levels. And you are so right, if you've never eaten "good" for a period of time this just won't hit home. Another thing I've personally noticed is that especially when having prepared my own "healthy" food for a period of time, when I eat out everything tastes SUPER salty! Anyone else had this experience? Living in our RV we don't always get to cook so we eat out sometimes but are always happier when we make our own stuff. The ideas in this post are also really relevant to think about whenever you're making a change in habits. No matter what the habit is, breaking one can be difficult, and sticking to the new one is even tougher. Come to think of it, any sort of lifestyle change (from dropping out of school and choosing to self-educate to deciding to start a business and quitting your job) can be tough. It's tough because we're comfortable in our habits. Human beings are creatures that want to put forth the least effort, and unless the pressure to change is massive, whether because of a skyrocket in benefits or an immediate danger to yourself, we're not going to change. Thinking of the consequences of what the new habit is going to do is will give you a reference point that sticks. To put it into context, before you switched to healthy food, it seemed like a difficult inconvenience, or whatever things along those lines. If you had known, however, (which, thinking about it, you did) that these would be the results--more energy, never feeling that compulsion to eat more junk, and the continuous ejoyment in eating something that does't make you sick--you'd have done it ages earlier. Your description of eating unhealthily after eating healthily is spot on. It could be useful to someone trying to break an addiction. Shooting up heroin might feel good for the first time, but afterwards it's just a compulsion that takes more from you than it gives. If you break that habit, you'll have a more sustainable way of living. Or for example, if you're a wage slave, working yourself daily for fourty hours a week might give you security in the form of a paycheck, but after decades of doing that you'll be more used up than a tijuana donkey in a side show. And for what!? You could have spent that time making your own money, building your own business, and not having to answer to anyone's deadlines and requirements but your own. I believe that it's mildly, if at all, influenced by my subconcious. I trust myself because although I noticed big changes when giving up simple carbs, I noticed nothing when giving up meat. Good points. I don't miss bread nearly as much as I thought I would. Vegetables also taste awesome once you cut out the sugar that desensitizes you to their taste. Soda is still proving hard to give up, but I'll get there eventually. If only convenience store sold hot tea! I wonder, as Matt suggested, how much you feel the enjoyment of healthy food has to do with feeling as though you're meeting your values? I'm reminded of an experiment that Penn and Teller did where they took a regular banana, cut it in half, and did the pepsi challenge with fans of organic food, suggesting that one half was organic and the other was not. Inevitably, the fans of organic picked a half, believing that it had a richer, healthier, more vibrant taste. Of course at the end of the day, regardless of why you feel that way I guess it shouldn't matter. Hola, Jovenes. I recently switched over to a primarily raw food diet. I've since modified it to include Ezekiel products. Why? Because a) they're awesome and b) I don't yet have my dehydrator, so there's no other bread products I can eat. Poor me. Since I switched over, the polyphasic sleep schedule has been going WAY better. The difference is day and night (my god, I'm funny). In the past 7 days I've overslept by maybe 4 hours total, less if I get credit for missed naps. Even more significant, I feel great the whole time. Right now it's 4:33am and I feel like I could play a full 5 round curling match. I've been tracking everything I eat lately, and putting some calorie numbers on them. 6 November Indian food: Rice, chicken, curry, vegetables.. Small banana. 900 cal. 9 November Lunch: Big portion rice, curry sauce, chicken. 1000 cal. 12 November Lunch: Two kinds of vegetables (one in very light curry), piece of chicken. 400 cal. This is kind of crazy. The only difference is, I ordered more vegetables and didn't get any curry on the chicken.